How many days do I need to fill up a 4TB storage? Almost 2 years by comparing the dates of the link above and this post. 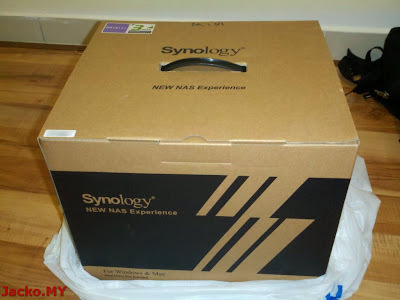 After 2 years, this is my second Synology NAS. 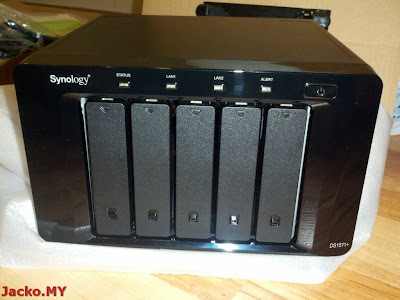 The successor of 1010+, Synology DiskStation 1511+. 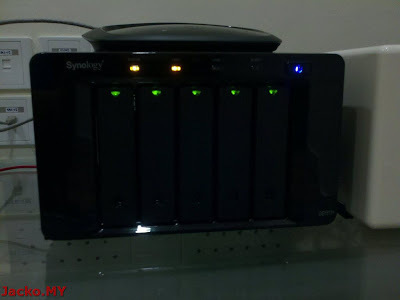 2 bays is not enough for me anymore, this is the latest 5 bays NAS from Synology. I also need the scalability for future expansion and this unit can scale up to 15 bays with expansion unit DX510. Check out the spec here. 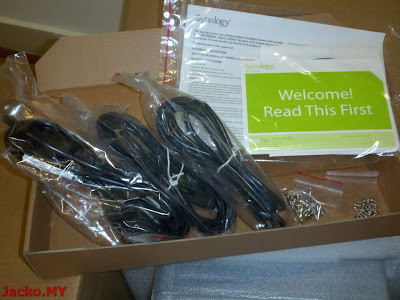 The package: 1 power cable, 2 LAN cables, screws for harddisk bay, warranty printouts and a software disc also downloadable from Synology site. Unlike my 209 with external power brick, 1511+ comes with built in power. On the right, from bottom to top, 2 Gigabit LAN ports which can be aggregated to improve the throughput provided that your switch must be capable to support it. 4 USB are laid closely to each other. As I mentioned in previous post, only slim USB cable can be used if you plan to use up all ports. The port above USB ports is the D-sub VGA port, an alternative to the web admin interface to manage the NAS. 2 big fans at the center, surprisingly the noise is negligible, hopefully the decibel doesn't increase over age. 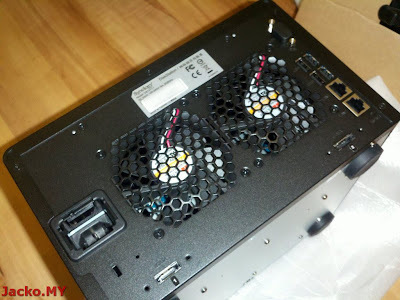 You find 2 eSATA ports underneath the fans, these are for expansion units. Hmmm... Unsure if the ports can support other eSATA devices such as Bluray drive? That's gonna be a big bonus if it does. Lastly, power connector on the left with Kensington lock right under. 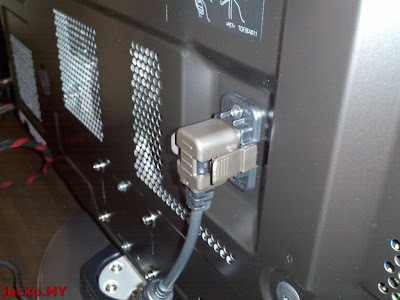 With clips to lock in the cable to the base. 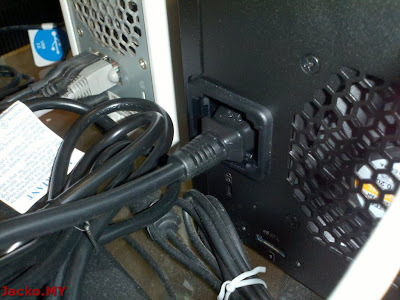 This prevents power loss due to loose power connection. The main board is on the left with a visible heat sink. 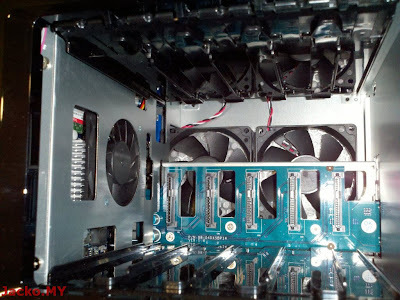 The RAM is upgradable, check out a detailed report by smallnetbuilder SNB at the end of this post. 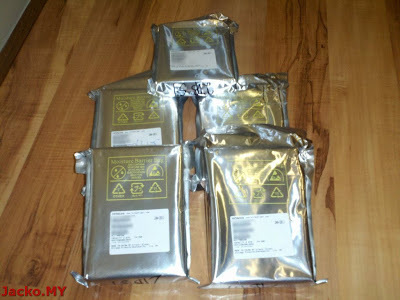 5 x Hitachi 7200rpm SATA III 2TB HDD. 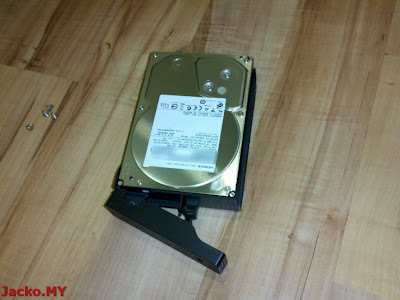 With Synology Hybrid RAID SHR, I will be getting a total of 8TB usable. 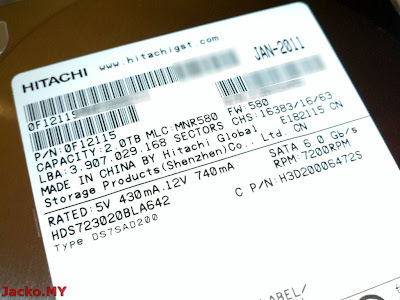 No 3TB HDD this round, the price is more than double of 2TB price ranging at RM700+. Perhaps it would be right time to get it with DX510 expansion unit in a year or two, or who knows I am running out of space in 6 months time. 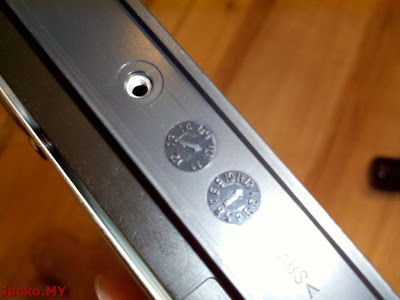 Just make sure the holes are aligned and secure it with the screws. Perfect! All green for the HDD. LAN is up and now is time for initialization. I am not gonna repeat the initialization part which is similar process to initialize my 209. No technical evaluation too as I am still running on 10/100Mbps network and therefore unable to testify the specification claimed by Synology. In addition, SNB has done a very thorough review on its predecessor 1010+ which should be still applicable to 1511+ except some improvements on its performance. The only differences between both are CPU (1.67GHz vs 1.80GHz) and expandability (1x eSATA vs 2x eSATA). This toy has been running 24x7 since January and I love it very much. The most significant improvement is the loading time of Bluray movies over network, a 50% reduction over 209 with similar network infrastructure. I expect further reduction when I finally found the ideal gigabit switch. Damn TM, I am holding this upgrade until I get Unifi to avoid buying something that is not compatible with the stupid Unifi design. Now the most interesting part - how much? 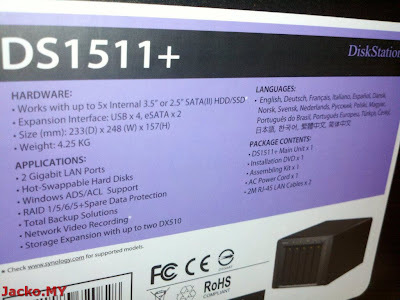 The package (1511+ with 5 x 2TB Hitachi HDD) costs me RM4800+ (discounted from RM5200+), a damn bloody good deal from C-Zone boss. You may get better deal if you're more regular and loyal to C-Zone than me :) And we bought not only 1 package but 2 packages (the other decided to go for WD Green HDD) from him. The other 2 of my members got theirs from Viewnet with WD Green HDD a week before me. Yeah, now everyone in my clique agreed with me that NAS is the way to go, they are cracking their head on what to do with the USB harddisks. Guess DX510 is not too far away, may be bonus month?